Early morning, Impala hotel, Moshi. I had just waved goodbye to Greg and Martyn who were setting off on a three day Safari and to Steven, Richard, John and Sam who were off to explore the highlights of downtown Moshi. We had just returned the previous day from Kilimanjaro, and after a night in a real bed I was looking forward to lying in the sun and immersing myself in my new book the One Thousand Autumns of Joseph de Zoet by David Mitchell. I had one rest day before the long journey home and I was determined to live it up to the full. Carefully arranging my recliner to give easy access to my cold drink, whilst catching the maximum amount of warming rays I settled back in total bliss in complete accord with my surroundings. I had the poolside to myself. The dragonflies droned and whizzed over the top of the water like little apache helicopeters and the hornbills croaked and swished their way past overhead on some kind of hornbill highway. Never has contentedness been so contented. However I had not even focussed on the first line, the first trickle of sweat had not even thought of trickling when voices crashed into my consciousness. Who was daring to disturb my tranquility. They came closer and into the periphery of my vision three figures appeared accompanied by laughter, the scraping of sun-beds and the general hullabaloo that only three teenage girls can make. Peering over my glasses and the top of my book I watched as the three said young Scandinavian ladies peeled off their various layers and settled back to absorb the increasingly potent rays. Hmmmmm I can forgive them for disturbing my concentration I guess, I am after all known to be a very forgiving individual who is happy to share my personal space with the great unwashed ! Then during the course of the morning the numbers of said ladies gradually increased to approx 20 plus individuals. The pool was like some kind of feeding ground attracting migratory birds who needed a rest and a chance to recuperate in the sun. It is said that if you simply sit back nature will come to you, guess it’s true – in a completely non sexist way of course. The guys came back from Moshi to find me surrounded by acres of gently cooking very attractive female flesh. “Now I know why you didn’t want to come with us” Richard voiced with a degree of chagrin, noticeably trying to find a space in the middle of this melee beside me. My protestations of innocence fell on deaf and generally uncaring ears, he was neither looking at or listening to me !!! Seven days earlier we had all met up at last after some missed flights and general mishaps at Kilimanjaro airport around 12 midday. Greg, Sid and Martyn had no luggage, it was still in Nairobi, but due to arrive on the next flight at 6 in the evening. 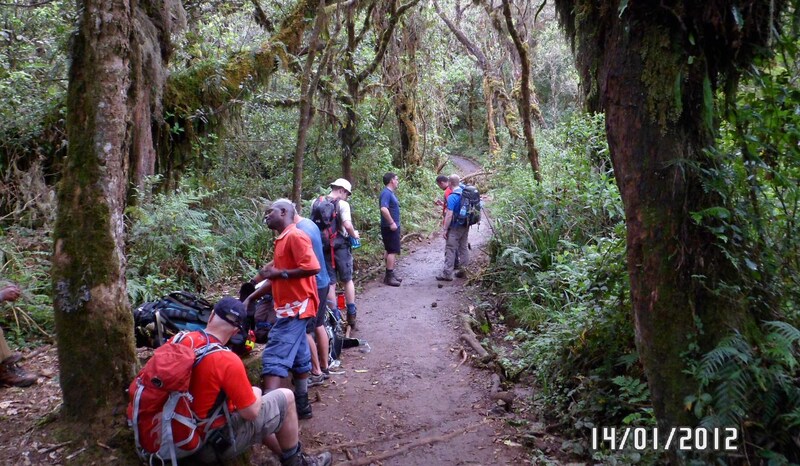 We needed however to get going as we still had to get to the Machame gate, two hours drive away, register to the park officials and get the porters and everything sorted then climb some 1200m through the tropical forest to the Machame camp where we were camping that night. This is one of my favourite bits about Kili, you start in tropical forest with all the sounds and smells of the jungle, then as you climb up you start to get views over the canopy through gaps in the trees. You are aware that you are gaining height as you can sometimes hear rivers gushing in chasms below you and just as you think it’s never going to end the vegetation changes, the size of the trees drops almost within 100m and you are into the giant heather forests with vies over the canopy and, if you are lucky, Kili rising above you. Credit to the guys on this one, we made it in around 5 sweaty hours with the thunder rolling around the trees and got into the camp just before darkness fell. The guys without luggage spent a rather uncomfortable night without sleeping bags but were greeted with views of Kili in the morning light when they rose rather unrested from the first night on the mountain. Day two is spent climbing up to Shira camp through the giant heather forests till they too disappear to be replaced by low lying scrub and everlasting flowers. 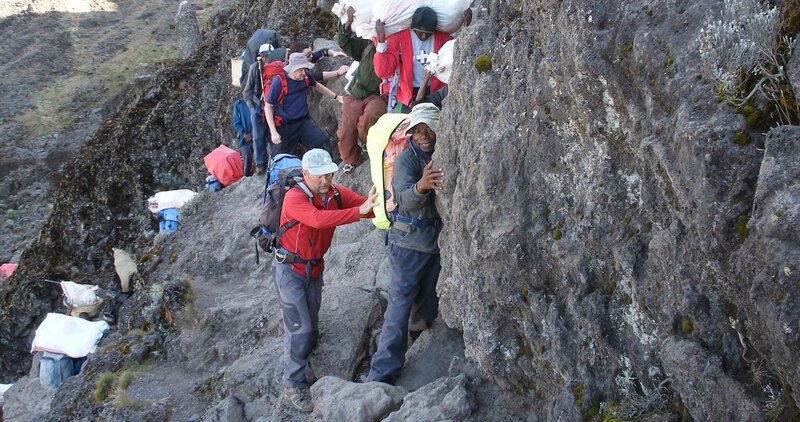 Again this is one of my favourite aspects of climbing Kili, you experience ever changing environments as you climb from lush tropical forests to Glacier, for the time being, clad rocks. Its a shortish day, only about 5 hours walking but the altitude is starting to bite and the sun is losing its warming powers. The guys were very happy that afternoon to be reunited with their bags which had been portered up from the Machame Gate. Down Jkts were hastily pulled out along with warming packs of Jaffa Cakes etc etc etc. Day three is a big day that takes you out of all the vegetation bands and into high altitude desert. From Shira you can climb to Lava Towers which is just short of 5000m. 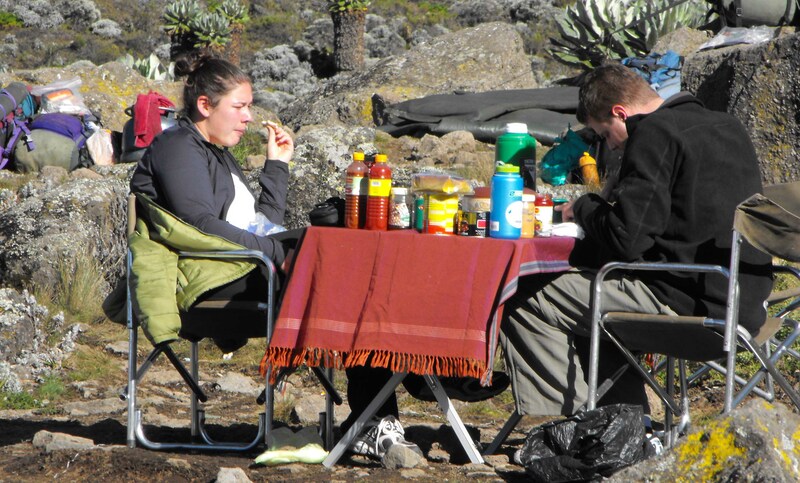 We however elected to keep our powder dry and stop short of Lava Towers, have lunch at 4600m and then drop down to Baranco camp at 4000m for the night. Baranco can be a bit of a mess, there are three major routes up Kili that collide here. 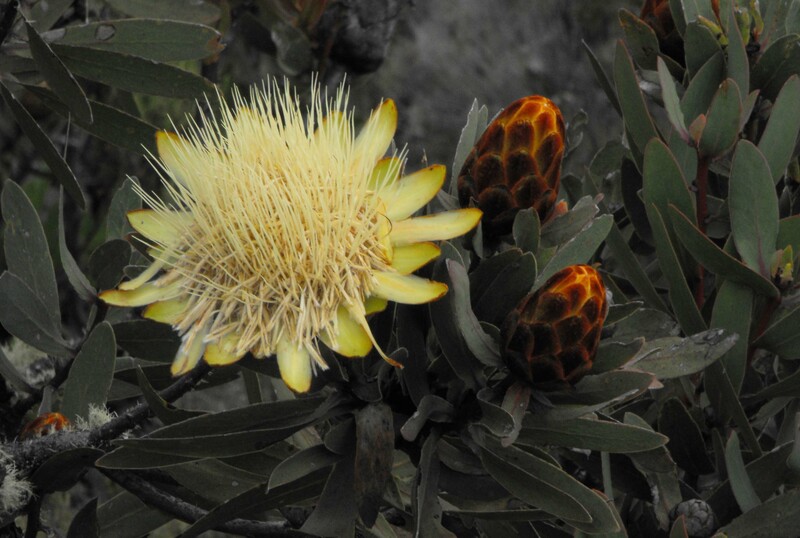 The Machame, the most popular route of al, the Umbwe and the Lemosho Glades. This makes this camp one of the busiest on the mountain with sometimes in excess of 1000 individuals camped in and around the area. Yes 1000, for those of you who have never done Kili and who might think it is a wilderness experience think again, it is a conveyor belt of punters and porters. This year however there were only around 300 – signs of the times and the worldwide financial crunch. The national park is also at long last making real efforts to clean the area up; there are regular litter picks and new toilets being built all of which is really making a difference to what was a bit of an environmental disaster zone. Day four is one of the days that most climbers doing this route hold in some degree of awe. In order to get to the next camp (Karanga) you need to climb the Baranco Wall. It’s probably a grade one scramble. Never hard, but there are a couple of awkward steps on it which keep you focussed. The benefits being that the focus makes you forget the effects of altitude and make a change from the slog of thin air walking. Once up the wall it’s over to Karanga camp at 4100m and a restful afternoon. On this day we were treated to one of the most distressing, in my humble opinion, aspects of commerciality and Kilimanjaro. A massive charity group had come up the Umbwe route and were in front of us. Why was it distressing, well apart from the shouting at the top of their voices Ugi Ugi Ugi, Oi oi oi all over the mountain, some of them were totally ill equipped, looked like they were about to die from lack of fitness and were just behaving like typical British louts on holiday. (Yes they were Brits and they were behaving like your worst vision of Brits abroad ). I and the rest of the group were mortified, our guides were horrified. “It is a big problem for us” Steven our chief guide told us. If you are going to do or manage a charity group make sure they are properly equipped, are able for the task ahead and behave properly on the mountain. Maybe I am a mountain snob but we made sure our camp was as far away from this group as possible and laid plans with our guides to ensure we were away earlier than them the next day. Day six starts at 0000hrs, yes its the big one, summit day. It’s cold and its dark, the altitude is nipping at lungs and it’s a big bloody day. As a leader on this mountain, I get really worried when people say to me “It’s easy, isn’t it ?” No it’s not, not even for the seventh time and not even for someone who does 6000m peaks often. It’s 1300m of ascent and approx 2000m of descent, in one day at altitude. It’s cold (can be -20 in the wind chill on the summit ridge). True it’s non technical and is just walking but it’s steep in places and you need to keep going to keep warm. It’s not easy and I do not know anyone who has ever done it that would in honesty call it easy. You also become accustomed to seeing some dreadful sights on this hill: I have seen one woman being dragged (literally) by two guides along the summit ridge to the summit, she could no longer walk. I have seen one man who had gone blind with the altitude tied to a guides rucksack being led the last 100m to the summit. This occasion was no different with one lady from the charity group being manhandled up the last steep bit of the ascent. There is little wonder that this mountain sees so many casualties. To try and do a 6000m peak ion only 5 days is in my humble opinion crazy, no one is going to enjoy it and the likelihood of getting to the top is much reduced, better to take 6 minimum. However the lads did superbly, we kept a good solid pace, the stops were kept as short as possible and we were at the summit for 0630 just in time to see the sun come over mnt Mwenzie to the east. Perfect timing. Then it’s back down to Barafu for a short break, pack up the kit, try to get rid of the headache, some soup and then on down to Mweka gate camp for a most welcome collapse into a warm sleeping bag and exhaustion driven oblivion. Day seven sees a return to the tropical forest walk, but this time it’s downhill, which I hasten to add is even harder than the uphill, muscles ache, feet hurt but the promise of a hot shower and a cold beer at the side of the pool spur you on to the gate, your certificate of ascent and the waiting bus to ferry you back to luxury. Would I do it again… you betcha. It was great to relive it through your blog.You said at the begining of the trip that we would learn alot. I have learnt that i love doing this sort of trek-i’ve got the bug! So if you are organising any similar trips please let me know. You helped to make Kili a great experience so thanks again. p.s. Just off to have some f@@ckin’ Jaffa Cakes!!!! Great write up ‘Bear’!. No really great write up Chris! Really enjoyed your company and draining you of that wealth of experience you have built up over the years. Personally I agree with Greg entirely and would relish the chance of going along on one of your future experiences. Once again thanks for being an excellent guide and would recommend anybody to accompany you on one of your many expeditions! You learn a lot and feel totally in safe hands. 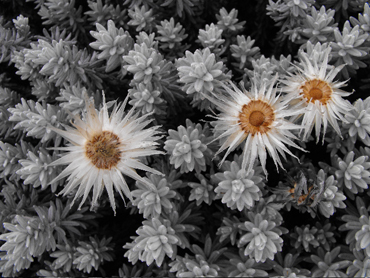 Thanks Martyn, sign up to follow my blog and see what I/We get up to. It might give you some ideas of what there is to do out there. I am reading this for a second time and still cannot believe we did it. As you know I did not make it on my first attempt but was determined to on my second. 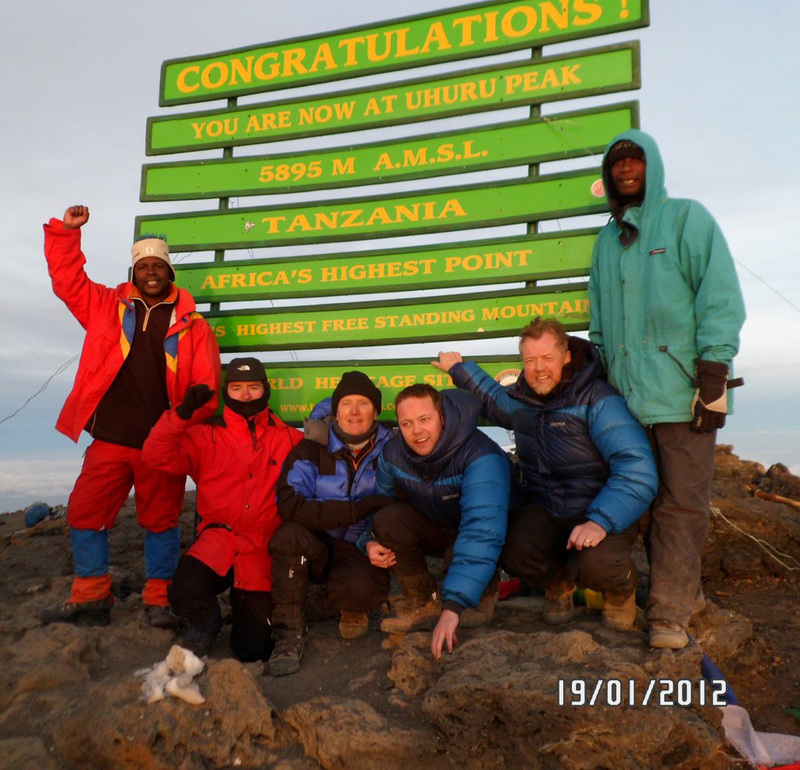 Thank you very much for your help and guidance during our Kili climb. I must also add my thanks to all the other group members who made it so memorable. quote from my daughter Annie after my first attempt. Kili may have broken me a little….but now I know even when I feel like I have nothing left to give, that there’s still something inside me, some extra reserve that I can call on that will somehow just get me through. It’s nice to know that I have this toughness to call on — I just hope I don’t need it again anytime soon!! Thanks for your kind comments David, but as you know it was not me that got you to the top, you did it all yourself. Maybe my nagging was a liitle bit of a help. Chris.